This principle brings our attention to ecosystem services. Those are services that the natural world handles for us, like providing us with clean water and handling waste by decomposing it into non-toxic elements that can then be reused in the system. It provides a heating and cooling system – though not quite as well regulated as we’d like it to be. So how do we work with natural systems by using renewable resources? And when we do use them, do we truly value them? Are we mindful to consume only what we need? Do we think about how our actions will impact the ability of the system to regenerate? In 2013 we had a chance to see what a permaculture garden actually looked like when we visited Harmony Park for the permaculture convergence. It was downright exciting to see what they have done to create a 1-acre food forest focused on perennial polyculture. A polyculture system is one that allows plants to self select which growing conditions they prefer. Plants often choose to live in “guilds” of plants that support one another in some way – vining plants by tall plants, nutrient-needy plants by plants with roots that pull nutrients from deep underground. Polycultures are more productive and resilient to weather and pests. For example, the food forest has bees. The bees 1) produce honey and 2) pollinate the food crops. The food forest also houses chickens and ducks. The poultry 1) lay eggs for eating, 2) produce meat for food, 3) eat bugs, and 4) produce manure that can be composted to enrich the soil. The food forest produces food that 1) flowers to feed the bees, 2) feeds the people and animals, and 3) decomposes to feed the soil. I loved visiting Harmony Park but their system isn’t one I can duplicate on my 1/10th of an acre in the city. Its sprawling, amazingly exuberant, tangled and … let’s say it has an aesthetic that I love but that others might not. It’s nature, after all, and nature doesn’t like to be contained. If I let my yard do what it wants to do, my neighbors and the city would have something to say about it. 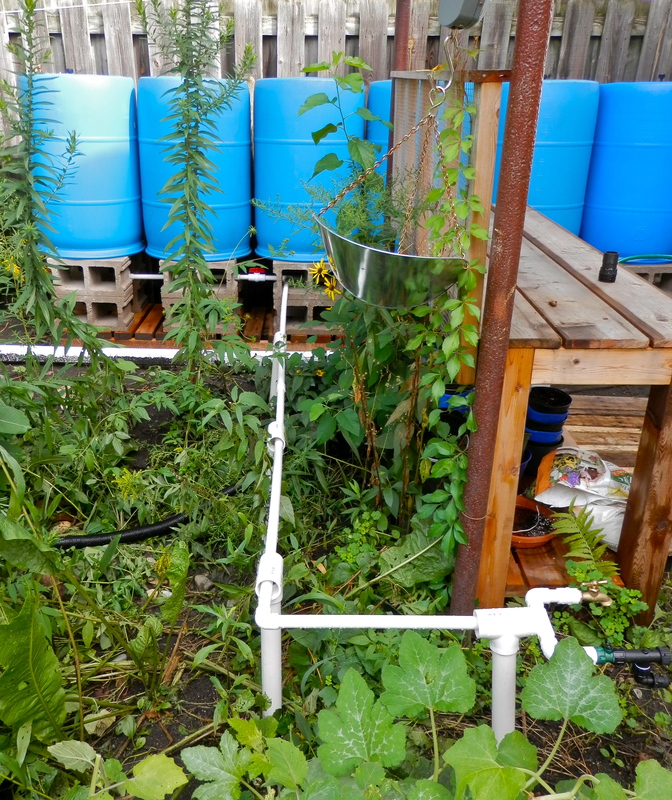 Our new rain barrel system collects 330 gallons. We use the sun to generate electricity, heat and light. It operates all our garden lights. We make a concerted effort to keep the water that falls on our property on our property. I want it to nourish my plants and then sink down to the aquifer, not run off into the storm sewer, taking silt and pollution down to the nearby Mississippi River and into the Gulf of Mexico. We collect it and use it to water our plants. We compost – a lot! We use plants to shade the south side of our house. We recently met a man who told us his father is so passionate about using solar energy that he sees every sunny day as a cooking day and is disappointed if he hasn’t cooked his evening meal in a solar oven. I know we could do a lot more with solar cooking. We could be growing green manure to feed our soil. Nitrogen-fixing plants such as gorse and broom can be cut and used as mulch around food plants. Red clover and mustard can be turned back into the soil. People are a renewable resource. This past summer we had a volunteer – Ben – who helped us install the grape trellises. How amazing that someone would just come and help! Are We VALUING Our Renewable Resources? I waste water. My husband thinks it’s my too-long showers, but I think my worst offense is how I water plants. When I get too busy or forgetful I put on the overhead sprinkler. Overhead watering is never the best option for my most important plants. It wastes water through evaporation and it waters things I don’t intend to water. It can hurt plants that want their roots wet, but not their leaves. I can also ask myself if I’m valuing the water that arrives at my tap. Am I protecting it from toxic chemicals by using a biodegradable soap and non-toxic household cleaners? Am I using as little water as I can for a task? Am I reusing water (grey water) whenever possible? I waste electricity. Because of the solar panels, I really feel this waste. When someone forgets to turn off a light or when I leave my computer and peripherals running when I’m not using them, I’m taking money out of my own pocket as well as adding carbon to the air by buying electricity from the grid. If I really VALUED those resource, I would change my behavior. This entry was posted in Food/gardening, Groups/Events, Water and tagged gardening, permaculture. Bookmark the permalink.